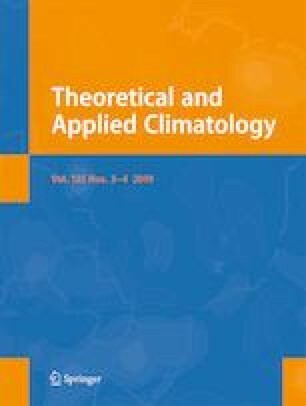 This study analyses spatial and temporal trends of precipitation and temperatures over Abruzzo Region (central Italy), using historical climatic data from a dense observation network. The results show a general, although not significant, negative trend in the regionally averaged annual precipitation (− 1.8% of the yearly mean rainfall per decade). This reduction is particularly evident in winter, especially at mountain stations (average − 3% change/decade). Despite this general decreasing trend, a partial rainfall recovery is observed after the 1980s. Furthermore, the majority of meteorological stations register a significant warming over the last 60 years, (mean annual temperature increase of + 0.15 °C/decade), which reflects a rise in both minimum and maximum temperatures, with the latter generally increasing at a faster rate. Spring and summer are the seasons which contribute most to the general temperature increase, in particular at high elevation sites, which exhibit a more pronounced warming (+ 0.24 °C/decade). However, this tendency has not been uniform over 1951–2012, but it has been characterised by a cooling phenomenon in the first 30 years (1951–1981), followed by an even stronger warming during the last three decades (1982–2012). Finally, correlations between the climatic variables and the dominant teleconnection patterns in the Mediterranean basin are analysed to identify the potential influence of large-scale atmospheric dynamics on observed trends in Abruzzo. The results highlight the dominant role of the East-Atlantic pattern on seasonal temperatures, while more spatially heterogeneous associations, depending on the complex topography of the region, are identified between winter precipitation and the North Atlantic Oscillation, East-Atlantic and East-Atlantic/Western Russian patterns. The online version of this article ( https://doi.org/10.1007/s00704-018-2427-3) contains supplementary material, which is available to authorized users. Authors acknowledge with gratitude Regione Abruzzo-Servizio Idrografico for providing the data analysed in this study. Brunetti, M., Maugeri, M., and Nanni, T. (2001). Changes in total precipitation, rainy days and extreme events in northeastern Italy. International Journal of Climatology, 21(7), 861–871. https://doi.org/10.1002/joc.660.